I took a literary journey through the works of Chantal Akerman thanks to two new books that have been published on her work. 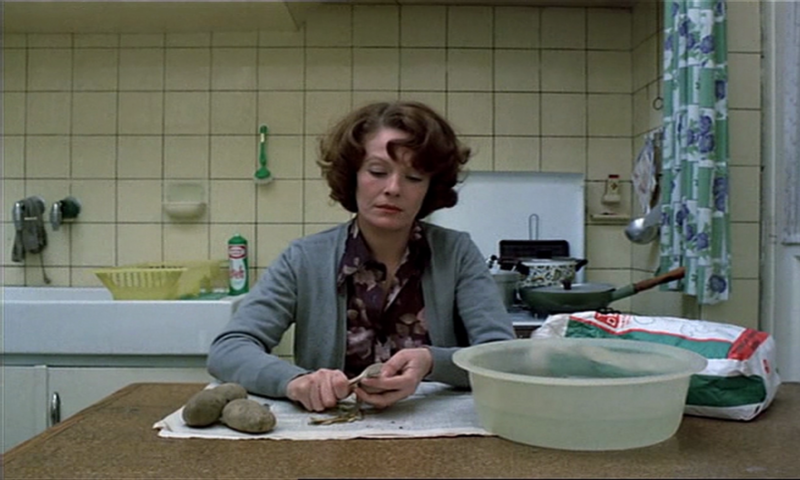 Not so long ago, I wrote about Chantal Akerman, Passer la nuit by Corinne Rondeau, which I found to be a great book, something that gave you a sense of how a Chantal Akerman film feels. It wasn’t a dry description, it was a book about experience. So from that point of view, it was a pleasant surprise to have yet another French-language book in my hand that dealt with feelings, sensations, memories. The most recent book on Akerman, Chantal Akerman – Dieu se reposa, mais pas nous, published just a week ago, was written by Jérôme Momcilovic, who also gave a lecture on the director as part of the major retrospective that is currently running at the Cinémathèque Française in Paris. What struck me first of all, from page one, is the way Momcilovic approached the task of writing about a director whose oeuvre is so vast and so complex (albeit it looks simple at first) that it would be easy to miss most of the essential stuff in a book of less than 100 pages. Momcilovic begins his book with a quote by Sylvia Plath, American poet and writer: “Light, as white as bones, like death, after all things…” A description of a scene from Akerman’s New from Home (1976) follows, an interpretative description, rather than a mere statement of what one sees. Once more, here’s a book which is very much in line with my own writing. I see it so often that “analytical” books contain more film descriptions than analysis (as we will see later on in this post), and the uses of synopses are, nowadays at least, limited. Brief, two- or three-sentence synopses are fine if you want to give the reader something. All other details are online. Books can focus on the depth and the experiential nature of films if only more writers would do it. In any case, Momcilovic does a great job here, carefully using short paragraphs for each essential thought, an essential feeling that one might have when one sees a certain scene. The book is not a description of Akerman’s films. Its a journey through it. Not necessarily going chronologically in his writing about her main works, Momcilovic follows thoughts, follows ideas, interrupted by Akerman’s own thoughts on specific films or her filmmaking career. He describes hers as “cinéma errant, nomade, vagabond” (nomad, wandering cinema) which is very much in line with Akerman’s being. Everyone has a different perception of time, but, Momcilovic writes, Akerman’s films gives us a special time which we can share with her films, with her work, be it at a hotel or at a bus stop. What matters most, however, is that one can never leave a film by Akerman. One has to stay with them one’s entire life. I was struck by this powerful statement and noticed that, without ever expressing it this way, I had the same feelings about the films by Lav Diaz. As Momcilovic suggests in his writing, you can leave the auditorium for a cigarette or for a pee break, but you stay with the film, or rather the film stays with you for longer than any screen time at a cinema. That reminds me of a very important aspect Andrei Tarkovsky mentioned: a good film is never finished at the end of post-production. A good film lives on in its viewer and its meaning is created only by the viewer. This is, Momcilovic seems to suggest, precisely the nature of Akerman’s films. Akerman’s films are regularly classified as belonging to a group of films that focus on duration, Momcilovic says. And yet, this classification – and I agree wholeheartedly here – creates a tension, potentially a rejection on the part of the viewer because it sounds as though those films are an endurance test, a “prison of time”. But, he argues, quite the contrary is the case. Akerman’s films, and I’d like to add all slow films, liberate the view, liberate the viewer, and therefore invite an active engagement with the film text. Momcilovic spends quite a good part of his books on recurring sounds in Akerman’s films, arguing at some point that no one has forced his/her viewers to listen to the silence of waiting the way Akerman had done in some of her films. And if it’s silence in some parts, then it is the outdoor noise that invades a room through wide open windows in others. I haven’t yet thought much about sound in Akerman’s films, but Momcilovic gave me a couple of ideas, which I’d like to investigate more in future. I wished I could finish this whole post with this quote, but there is still one more book I’d like to speak about briefly. Quite some time ago, I reviewed a book on Pedro Costa, an edited collection that appeared in edition text + kritik (Germany). They published one on Chantal Akerman last summer, edited by Fabienne Liptay and Margit Tröhler. The two books couldn’t be more different from another. One feels like a collection of thoughts, liberated and liberating. The other is a rather rigorous study of Akerman’s oeuvre that allows little room for the reader’s own thought. In nine chapters, various themes are explored, albeit I had the feeling that synopses and detailed descriptions played a major role, which, at times, put me off actually watching more of Akerman’s films because everything was said, and in such descriptive detail that, technically, I wouldn’t need to see the films anymore. This is a shame and something I always dislike about writers, academics, and especially editors who decide to publish stuff like this. Giving away everything from a film means ruining it for the reader, unless you want your readers to see everything beforehand or if you want readers without an intention to discover. That, for me, is a bit how Chantal Akerman felt at certain points. At other times, the authors make several good points which are useful for my own work. Eric de Kuyper, for instance, argues that Akerman’s work is so extremely autobiographical that it’s no longer noticeable. It’s everywhere, and yet not always as visible or as easy to grasp as in other works either by herself or by other directors. Furthermore, his point on the use of a static camera is interesting. It’s something I had never thought about this way. Kuyper argues that the absolute stasis of the camera highlights the presence of the director, making his/her presence behind the image we see palpable. There is someone recording the scene we see, he writes. I personally always thought of a static camera in the context of an arresting image, of photography, of death in certain ways. Kuyper speaks of presence, meaning life, which makes me rethink a bit what I had argued in the past. In her chapter on Hotel Monterey and Les Rendez-vous d’Anna, Michelle Koch suggests that the contemplative look at empty rooms and the way certains scenes are edited turns physical architecture into a mental space (or “room”, as Koch writes). I have seen neither of the two films yet, but Koch’s argument reminds me of something I myself have argued in my PhD thesis regarding the use of makeshift and run-down houses in the films of Lav Diaz to reinforce an image of despair and mental upheaval. I also wrote an unpublished essay on the uses of architecture and double framing in the films of Béla Tarr and who immediately comes to mind in this context is, in fact, Tsai Ming-liang. Akerman’s use of physical spaces to evoke a mental space, to me, is consistent with other directors’ uses of physical spaces in order to show their characters’ mental upheavals. The longest chapter in the book, I believe, is Heike Klippel’s thoughts on Jeanne Dielman, which is situated somewhere between Momcilovic’s free thinking and this very book’s rigorous descriptions. Nevertheless, there are some points to take away from it. I’d like to point out just one here. Klippel suggests that the way Akerman films everything in detail would normally suggest an abundance of information. Her long takes show everything in detail. And yet, especially in Jeanne Dielman, you have this discrepancy between showing and not showing. One example is Jeanne doing the dishes, but she’s with her back towards us. We know what she’s doing, but we cannot see it. So, can we actually know what she’s really doing in detail? Akerman blurs the line between the visible and the invisible, between the idea of showing detailed everyday activities and hiding details, keeping secrets about what’s going on. Overall, both books have their own way of approaching the rather comprehensive and complex oeuvre of Chantal Akerman. I believe that Momcilovic succeeded in getting to the depth of Akerman, really focusing on the vertical axis (the experiential, the emotional) in many cases, whereas the other book is more for people who prefer a rigorous reading of single scenes. One is French, the other in German. I hope that at least Momcilovic’s piece will be translated into English soon. I have read carefully your text about two books on the films of the Belgian-Jewish filmmaker Chantal Akerman. I have already had the opportunity to read another text of yours, in this blog, in this case on the book Austerlitz by W.G. Sebald. I want to read a few more texts from your blog, not many more, for the simple reason that, as a cinephile, I do not fit into the so-called field of contemplative or observation cinema, which puts TIME as a «Transcendental Category a Priori», to use one concept of the German enlightenment philosopher Emmanuel Kant. For me, cinema is above all an instrument of observation of economic, social and cultural reality; or in other words, it is social science – philosophy, sociology, anthropology, history, law – applied. In and through the cinema I look for a platform to understand REALITY; this is what can lead me to see films by the Hungarian filmmaker Bela Tarr (the anthropological pessimism) but also films by the German filmmaker Angela Schanelec (the determinism Vs. indeterminism vs. chance), or the Romanian filmmakers like Cristi Puiu (the social apathy), or also films of the Greek filmmaker Alexandro Avranas (the society / state is a great predatory beast), or films from the British realists, such as Ken Loach (the exposure of inequalities, poverty, the mechanisms of exploitation of some people by others) , etc., etc., etc. But I don’t want to dwell on this comment any more than to say that in reading your texts, apart from the honesty and sincerity that characterize them, I felt the DUTY to reveal that it is extremely rare to read texts so elegant, so clear, so beautiful as those you wrote. This is what I want to say, and only this: your texts are written in one of the most beautiful prose I have ever read. Dear Vitor, I’m very touched by your comment. Thank you so much. Your words move me and I’m very happy to see that my work resonates with you, even though you’re not even in the same field. Thank you, thank you, thank you.